One of my friends bought me a baking cookbook from a well known bakery in San Francisco a few years ago for my birthday. I went through the whole book and tabbed the recipes I wanted to tackle. One of them was Parisian Macarons. 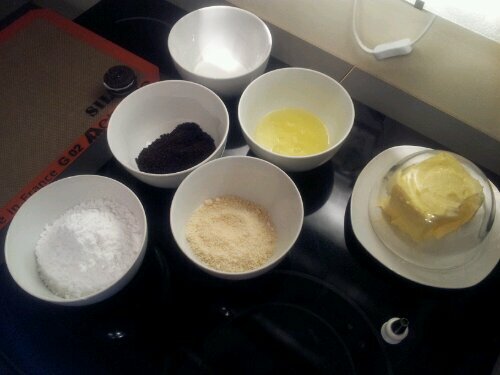 I bought all the ingredients and got ready to make them. Then fear set in. Hearing about all the times that people have failed making these, I ended up talking myself out of it. Skip a head a few years to when I got a new job. With a new job means new colleagues and new friends! And it didn’t take them long to catch on for my love of baking. One of my new colleagues and friends sent me a recipe a few weeks ago and asked if I could make these, as baking isn’t her strong suit. Nervously, I accepted the challenge. 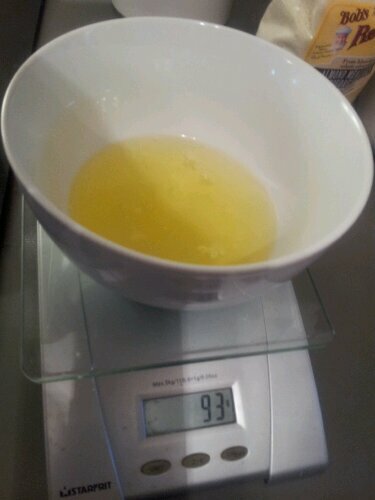 After reading a bunch of reviews, tips and tricks, we agreed that a kitchen scale was key to making these special delights and to make sure we that we do not over beat the meringue. Over beating would create a thinner pancake batter consistency. 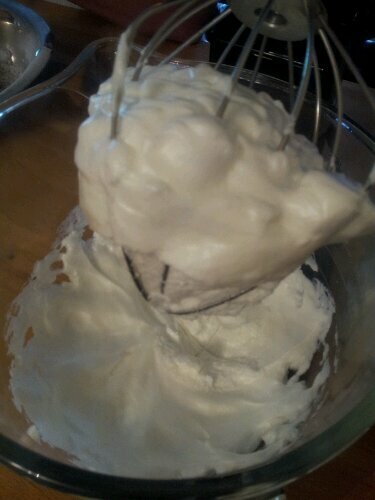 We aimed to get stiff peaks that clump inside the whisk. Another awesome tool to have in the kitchen is a metal sieve. This allows to keep any big cookie or almond bits out of the batter which could alter your cooking time, and over all look of the cookie. This is my friend Meaghan (the one who requested we make these and the guest photographer of this post! 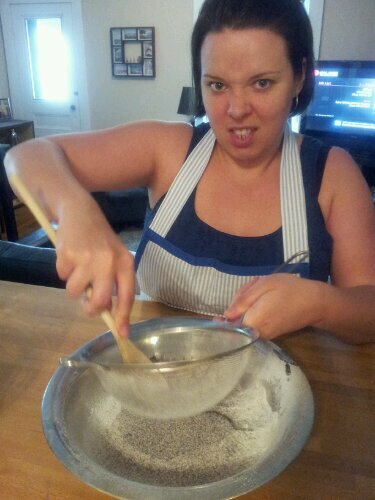 except for this picture of couse) putting the dry ingredients through the sieve. You can tell she’s enjoying herself. Keep in mind that it can be tiring trying to push all the bigger cookie and almond bits through, but in the end, it’s worth it. 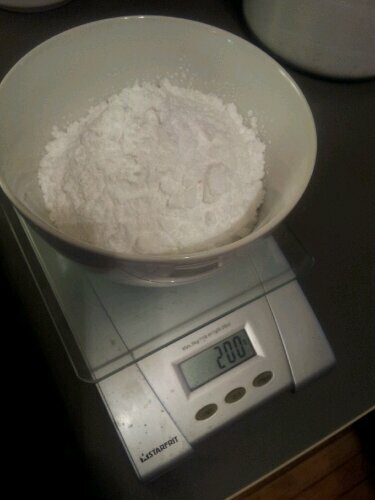 Folding the meringue into the dry ingredients is very delicate. Rubber spatula is best. 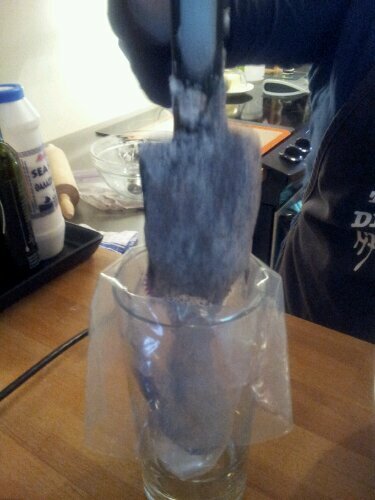 When I’m filling a pastry bag, I like to use a big glass or cup to hold it while I scrape down the bowl. 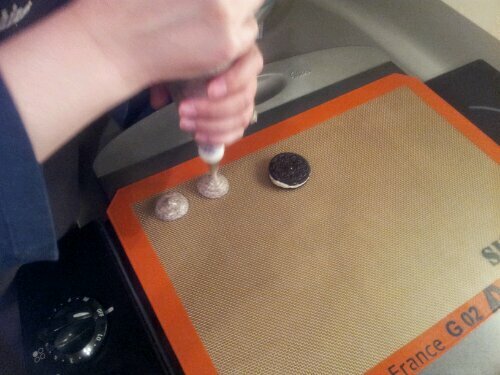 For piping out the batter, use a round tip and pipe onto either parchment paper or a silicon sheet. This will help with the stick factor and be easier to remove once cooled. Some people use circle templates or draw circles onto their parchment. We eyeballed it and compared it to an oreo nearby, as the oreo filling was going into the middle of these delicious treats. 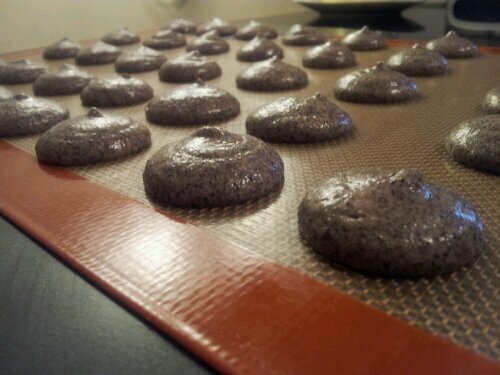 The site we got this recipe from, Picky Palate, suggested to count out 5 seconds while piping. I learned that this works while keeping consistent pressure on the bag. Otherwise, they come out lopsided or in different sizes. Once piped, tap the tray once or twice to make sure there are no air bubbles. This may also help with the little tip on top that is left after piping. I realized on mine that they didn’t all fall, so some have little nubbies. If you’d like, you could try and tap them down with a moist finger, but not sure how strongly I would suggest it. Picky Palate said that she didn’t let hers rest before popping in the oven, but we wanted to make sure that they baked evenly, and traditionally, they are supposed to sit for awhile which allows the feet to be created. We waited 10 minutes before popping in the oven. While the cookies are baking, we took the opportunity to make the cookies and cream buttercream, with two whole oreos, creams and all! My tip here is to make sure that the cookies are crushed enough as we had some issues with pastry bag blockage while piping on the cookies. If this happens to you too, use a chopstick to stick back into the bag and move the cookie bit out of the way, or crush it against your fingers. I can’t even explain the giddiness of us two when we took them out of the oven. Yes, they have nubbies, but keep in mind they are delicious nubbies and not all of them have it 🙂 We let these cool for 10-15 minutes before we started picking at them. Ultimately, leave them to cool completely if you can restrain yourself. I only have one round tip at the moment, so we used a big star tip, but in the end, we just used the coupler to pipe the buttercream, even though the star comes out so pretty. To ensure we had enough tops and bottoms, we flipped every other row and ate the ones that didn’t make the cut. Poor us. hahaha. 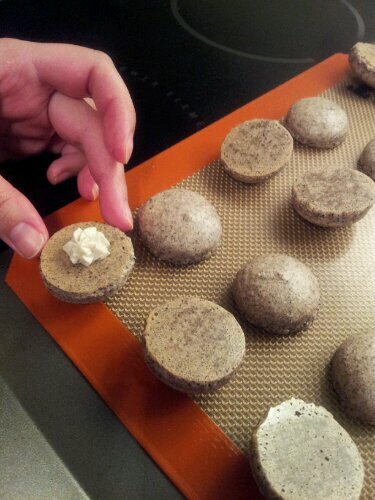 Once we piped a thumbnail size of buttercream on the over turned macarons, we placed the cream from the oreos on top followed by another little dollop of buttercream as glue for the other macaron. More giddiness ensued. The mouthful delights weren’t as scary as I had originally thought. 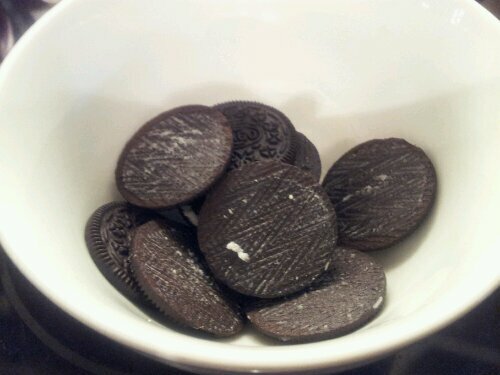 The most time consuming thing from this recipe, was taking apart the oreos and the waiting. Preheat the oven to 280 degrees. 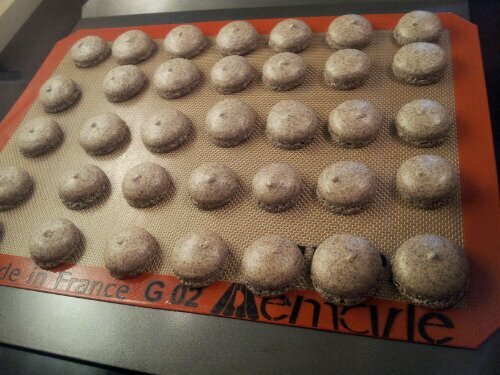 Line your baking sheet with the parchment paper or a silicon mat. Twist apart 24 oreos saving the cookie ends (about 8). Using an offset spatula, gently take out the creams, place them on a plate and put them in the fridge to be used later in the middles. 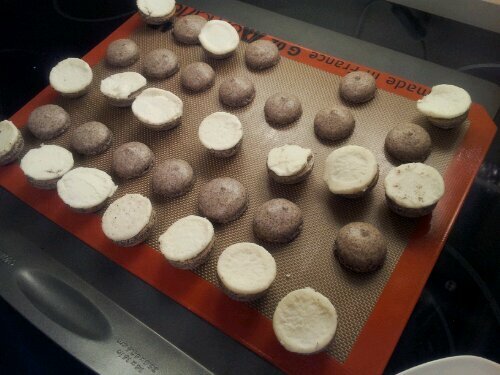 Place about 8 cookie ends (without the cream) into a ziploc bag and finely crush. 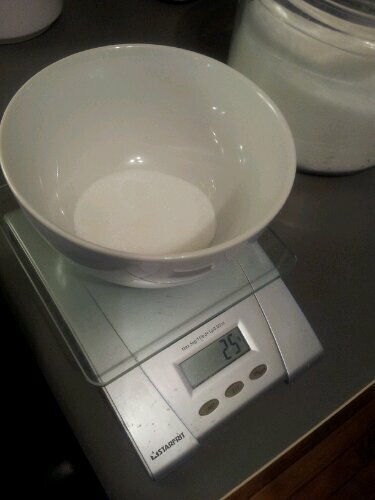 Weigh out the almond flour, crushed cookies, sugar, powdered sugar and egg whites. 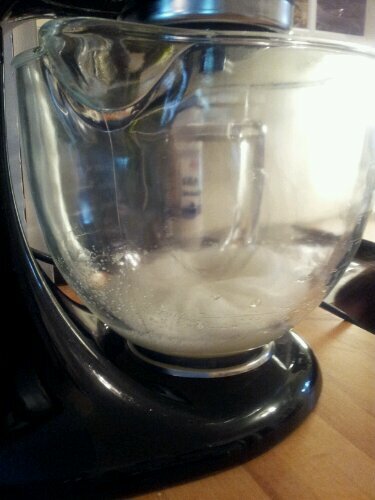 With a hand or stand mixer, beat together the egg whites and regular sugar until stiff peaks form. Set aside. 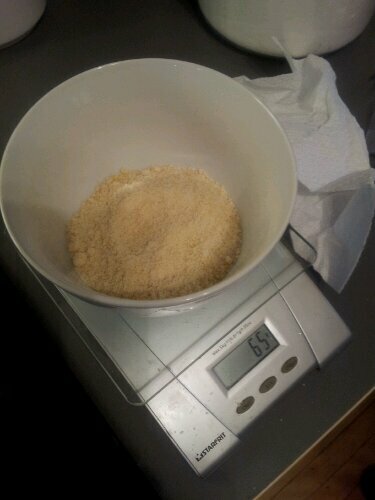 In a medium bowl, stir together the rest of the dry ingredients, the powdered sugar, almond flour and cookie crumbs. 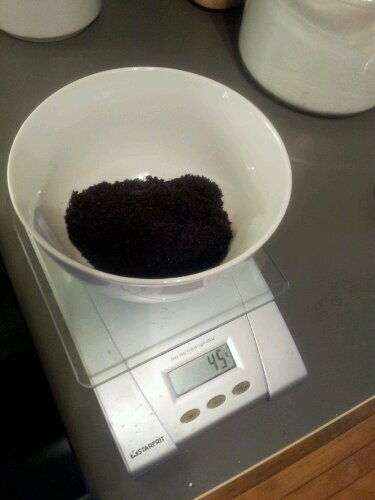 Using a metal sieve, sift together until all has passed through. 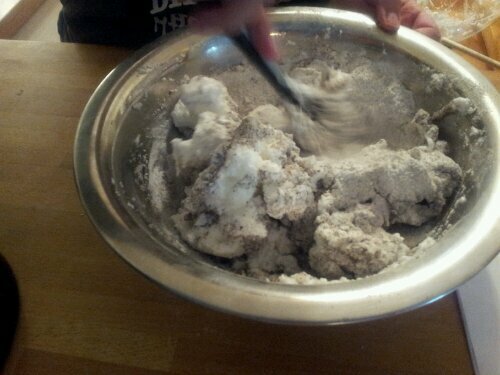 Once sifted, fold in meringue mixture until it’s all combined and there are no more meringue lumps. 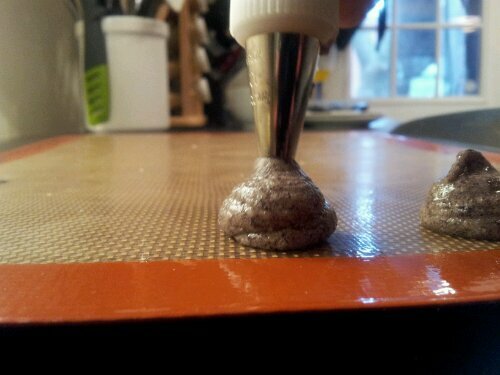 Place batter into a pastry bag using the big round tip. Pipe on the lined baking sheet counting 5 seconds for each and making sure they are at least a 1/2 inch from each other. Tap the baking sheet once or twice on the counter to release any air bubbles. Let rest for 10 minutes. Bake for 25 minutes, you’ll see the feet that have formed. 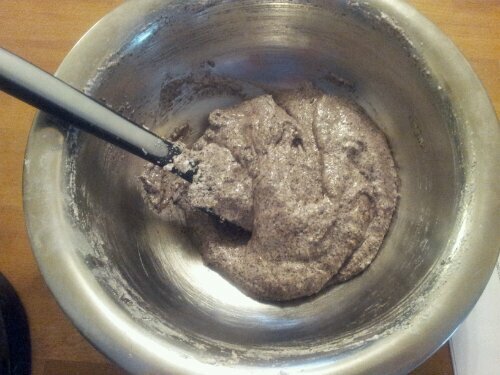 While the macarons are baking, in a stand mixer, mix together the unsalted butter, powdered sugar and broken oreos. 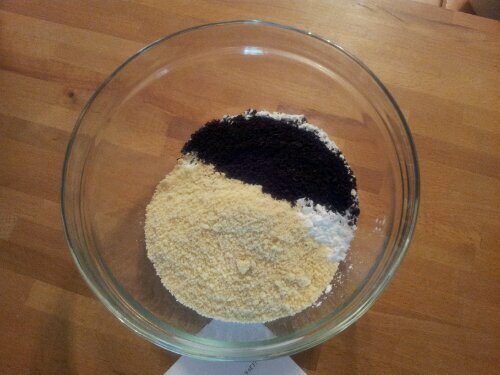 The stand mixer will also help crush the two oreos. Add buttercream to another pastry bag either using another round tip or just the coupler. Once the macarons have cooled completely, using a offset spatula or turning gently with your fingers, release them from the baking sheet. Turn over every other row making sure that they are paired up. 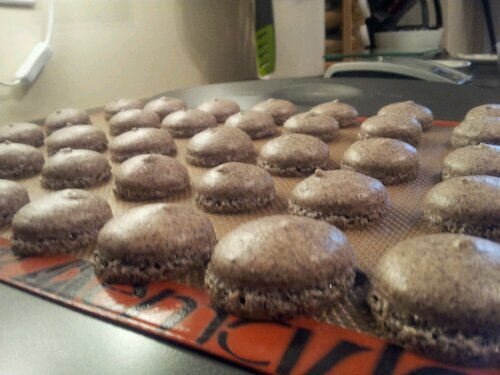 Pipe the buttercream onto the bottoms of the macaroons that have been flipped over. 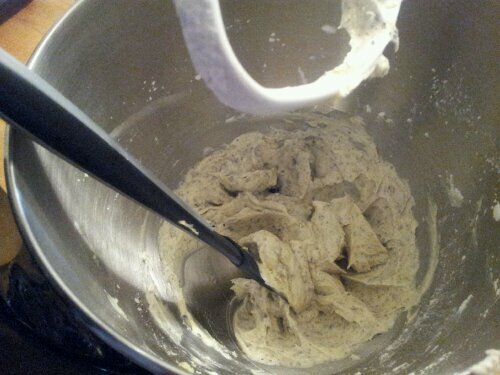 Add an oreo cream and pipe again with the buttercream. Top it with a macaron. Can be eaten right away or stored in an air tight container for a few days in the fridge. Don’t be discouraged! You sound like me and toffee. We don’t get along. I told myself I would try in a few months when my ego heals 🙂 But this macarons recipe is definitely worth a shot! It was a very good thing! We filled half with just the buttercream and the other half with both buttercream and oreo filling. Both types were delicious! 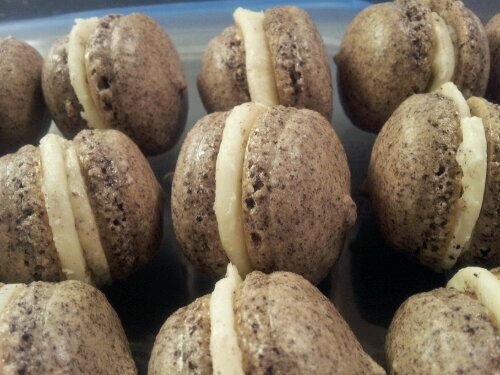 The Coffee-Chocolate macarons that I made a little awhile ago came out perfectly. I learnt some new tips from Le Cordon Bleu. So if you would like to try again, please let me know how they turn out! Thanks so much Choc Chip Uru! I’m glad you’re enjoying it! I really admire you for attempting this! 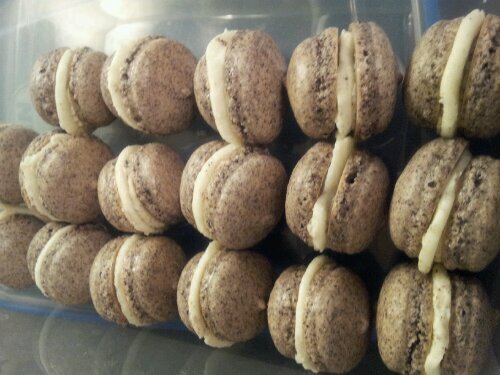 I have often admired macaroons on blogs, but have yet to eat one in real life. I think it would be fun to try to make them. You gave such great instructions, and I appreciate all the pictures, too. I could just feel your excitement when they turned out so well. Congratulations! Thank you Cookazido! The more I made them, the better they got. This flavour was my first attempt ever 🙂 the other flavours on the blog came after taking a class at Le Cordon Bleu 🙂 let me know if you give them a try!